Welcome to the last issue of Vita Nuova for 2017. 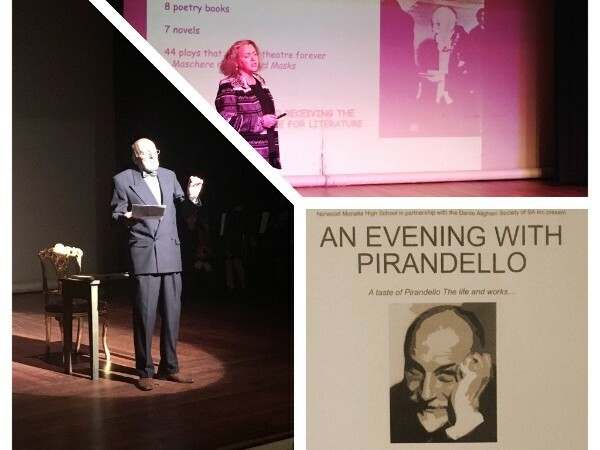 The quote above was inspired by ‘An Evening with Pirandello’, an event organised by the Dante Alighieri Society and Norwood Morialta High School at the beginning of December to celebrate the 150th anniversary of the birth of Pirandello. The students’ outstanding theatrical performance in both Italian and English was an excellent example of how the Italian language and culture can be integrated into our schools and our multicultural society. The three PLIDA Language Proficiency Courses for beginners (A1), continuers (A2) and low-intermediate speakers of the language (B1) and the two “Caffe Italiano” conversation classes have been successfully completed. We are currently advertising the Italian courses for next year. Thanks to our teachers, Giuliana Otmarich, Ciro Pipolo, Beatrice Barbieri, Anna Mazzone and Stefano Bona, for their commitment and for ensuring that students enjoy and continue learning Italian. This year we have also created and delivered “Ciao Italia! Introduction to Italian”, an 8-week course on Italian language and culture for Optus. Following the positive feedback, next year we will propose this program to other companies. Thanks to Ciro Pipolo for organising the reading of “Purgatorio” throughout the year. The reading and discussion sessions will resume next year. The Italian Language Assistants program for schools in South Australia started in May, running during Term 2, 3 and 4 of the school year, and concluded in December. This year the program has involved 7 language assistants operating in 13 schools and being in contact with over 2,300 students. Once again, the program sees the successful cooperation of the Dante with the SA Department of Education and Child Development and the Catholic Schools Office, with the support of both the Italian Consulate and the Director of the Italian Educational and Cultural Office in Canberra. The success of the project and its smooth operation is also the result of the outstanding work of Beatrice Barbieri, the Schools Project Coordinator and long-time volunteer of our association. Thanks also to our “assistenti” who create a link between Italy and Australia, bringing our Italian language and culture into local schools. December has also seen the conclusion of the first Italian Playgroup & children’s language course (0-5 years old) run during Term 3 and 4 of the school year. The program was run in collaboration with Playgroup SA and with the support of Grant SA. The initiative has received such a positive feedback and response from the community that we are already planning a new edition next year. Thanks to Antonio Mercorella and Isabella Bracco for applying for and obtaining the grant and for organizing the program. Thanks to the teachers who ensured that all kids would learn Italian while having fun. In particular, thanks to Pamela Di Rocco, who has created ad hoc materials and planned lessons for children, making the learning enjoyable for both parents and children. 4-5th November, Carnevale – As in previous years, we were present with our stand at Carnevale to provide information about our association. 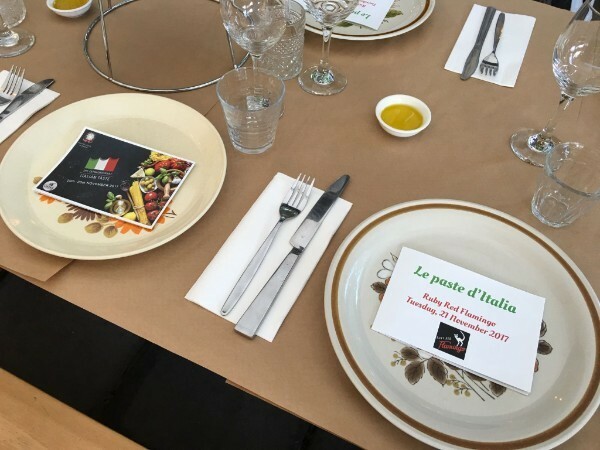 21st November – ‘Le Paste d’Italia’ Dinner at Ruby Red Flamingo restaurant to support “La Seconda Settimana della Cucina Italiana” promoted by the Italian Consulate. I would like to thank my husband, Gianluca Orru, for making this event possible, for helping in the overall organization and throughout the night. Thanks also to Ruby Red Flamingo for supporting us and for accommodating any request. 22nd November – Award and Exhibition night for this year’s school competition organized together with SAATI on the occasion of the second Week of the Italian Cuisine in the World. The winning students, teachers and schools from Reception to Y9 received their awards from the Italian Consul for SA, Roberta Ronzitti, during the festivities at the Marche Community Club. Thanks to SAATI, the Consulate and the Marche Club for the cooperation and for the successful outcomes. 1st December – ‘An Evening with Pirandello’, a theatre performance of extracts from Pirandello’s works and writings by the students of Norwood Morialta High School. Thanks to Emma Luxardo for her initiative, for coordinating the project and for her hard work. Thanks also to Norwood Morialta High School for embracing the challenge and delivering such a great performance. 5th December – We concluded this wonderful year with a Tombola night ‘Napoli style’ at the Campania Club. Guests enjoyed pizza and panettone while playing tombola and learning about the meaning associated with each of the 90 numbers by ‘La Smorfia napoletana’. I would like to thank Natasha Marona and her mother for, not only organizing the night, but also for ensuring the smooth running of the event. Thanks to the Campania Club for having us and for supporting us. Throughout the year, we have also collaborated on many occasions with both Italian local radio stations, sharing information and delivering programs. 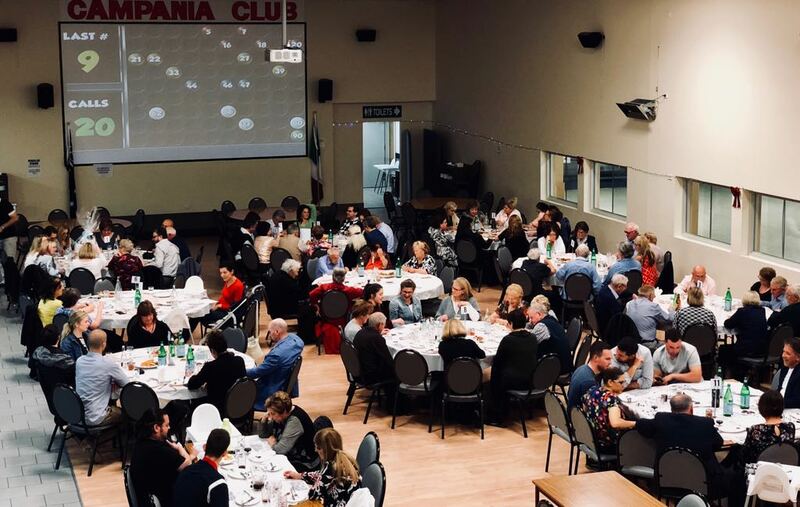 Our role in South Australia’s schools and in the Italian community has been consolidated and we look forward to further strengthening our collaboration with clubs, associations and other communities. We will continue to offer a wide range of quality events, programs and services to promote our Italian culture at all levels. At the same time, we will continue to support and promote the teaching of the Italian language and culture in schools in South Australia. I invite you to look at our calendar of events and offered courses for details. When I started this new adventure with the Dante back in February, I was somewhat overwhelmed by the journey ahead. However, with the help and support of the Dante Committee volunteers, our families and members, this has been a wonderful journey so far – and it is only the beginning! Thank you. I would also like to say thank you to all our supporters and sponsors. All donations for our events have been much appreciated. We need your support, the support of the entire Italian community, to ensure we continue promoting our language and culture, keeping it alive for future generations. 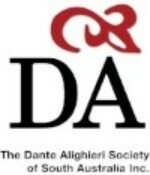 We look forward to new members joining and invite you to read our news and continue to follow and like our page Dante Alighieri Society of SA Inc. on Facebook. Let me conclude as I started – what a wonderful year for the Dante Alighieri Society of South Australia! What a year it’s been for Dante Kids! 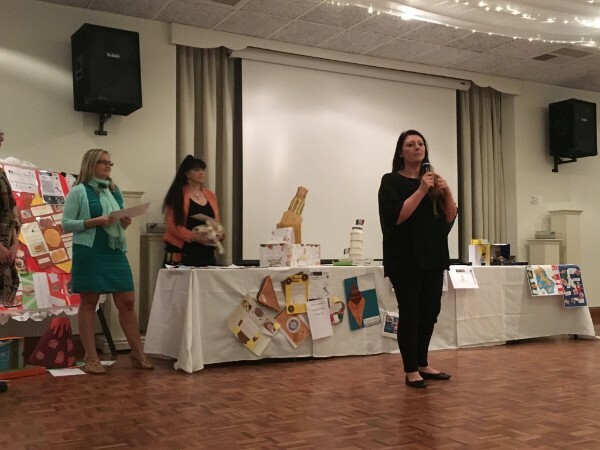 Having kicked off in Term 3, the playgroups have been really well received and has highlighted that there most certainly is a need and a demand for a forum such as this so that young children can begin the journey of learning the beautiful Italian language. 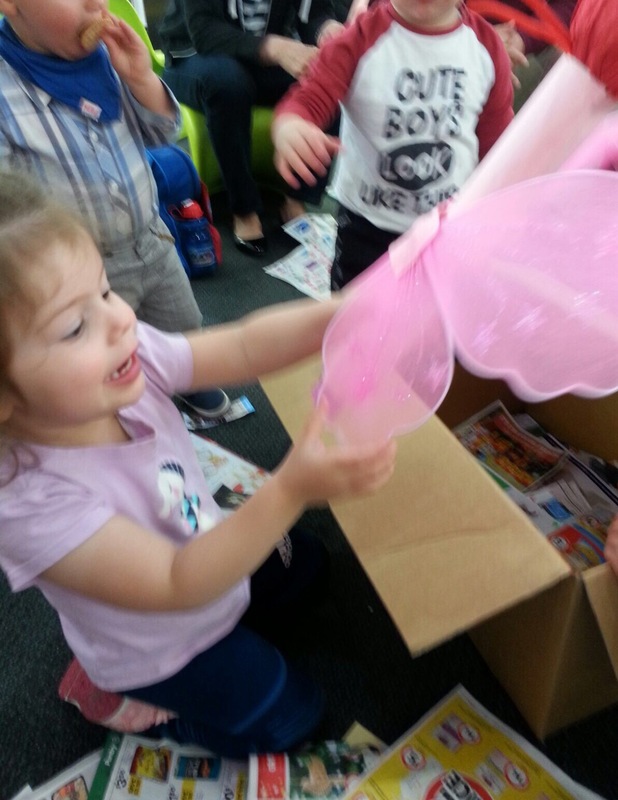 Being a pilot program, this year we ran the playgroup from two locations, one in the city at the Multicultural Communities Council of SA offices, and the other at the Campbelltown Library. With two fantastic and passionate playgroup co-ordintators, Pamela Di Rocco and Isabella Bracco, and with Beatrice Barbieri who oversaw the educational content of the playgroups, Dante Kids has provided a terrific forum for families to come together with others families in an educational but fun way with the aim of teaching children Italian and about Italian culture. From week to week various themes and topics were covered, such as animals, parts of the body, colours and of course going through the beautiful children’s book “Il piccolo Bruco Maisazio”. With the help of Playgroup SA, we also held a “messy playgroup” which was a lot of fun, where children could get their hands dirty and paint and express their creative side. 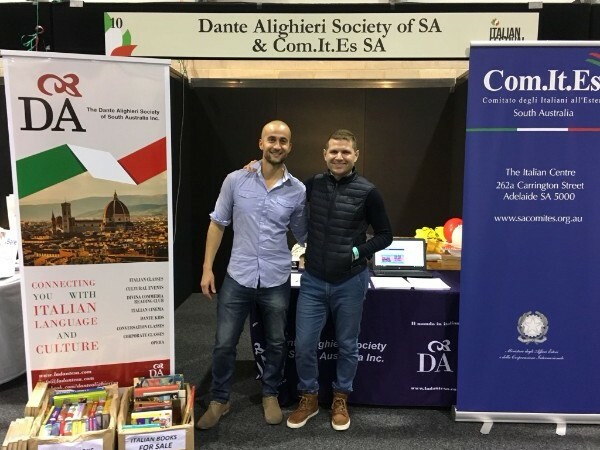 Dante Alighieri Society of SA would sincerely like to thank all of the families that came along this year to support this new initiative and to all those that made it possible including the MCCSA, the Campbelltown Library and Playgroup SA. With your continued support, Dante Kids will be back for the beginning of Term 1, 2018 bigger and better than ever! 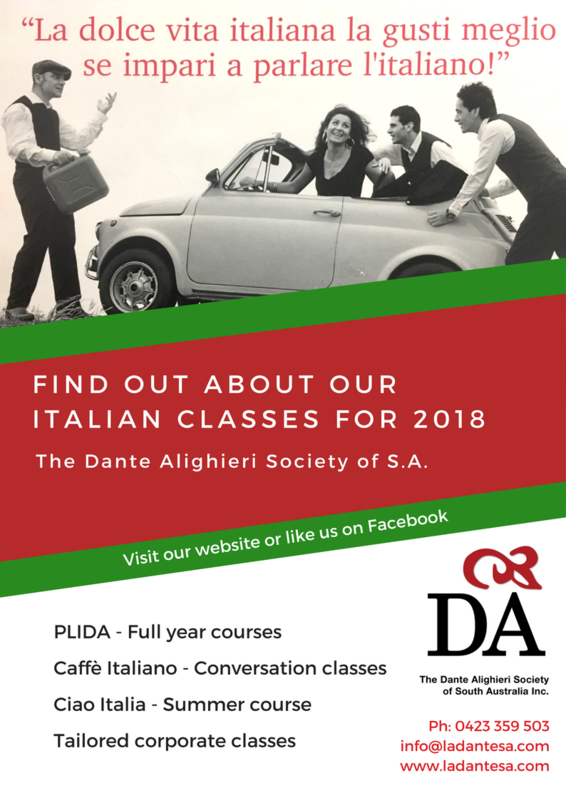 For further information or enquiries about getting involved next year, please contact Dante Alighieri by email at: info@ladantesa.com.au or by phone on 0417 862 469. 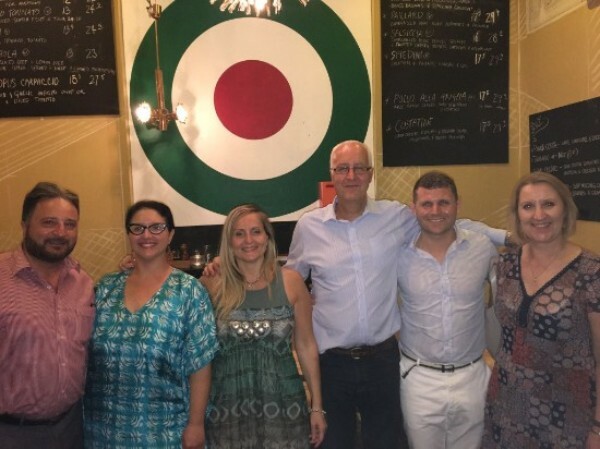 In July Optus contacted the Dante Alighieri Society enquiring about a short Italian course for their employees. They wanted to give them an opportunity to socialize and to engage with cultural diversity. We loved the idea and we accepted the challenge. Two teachers of our team – Beatrice Barbieri and Stefano Bona – sat down to create a course for a corporate setting that was hands-on, filled with Italian culture and, most of all, fun. The adventure took place in Adelaide, from mid-August until the beginning of October, and we covered Italian food, fashion, regions, as well as the basics of Italian grammar. We received enthusiastic feedback and we thank the OPTUS team for the opportunity.